Go Green for Pharmacist Support! Kermit the frog once said ‘it’s not easy being green’. But this year it is! 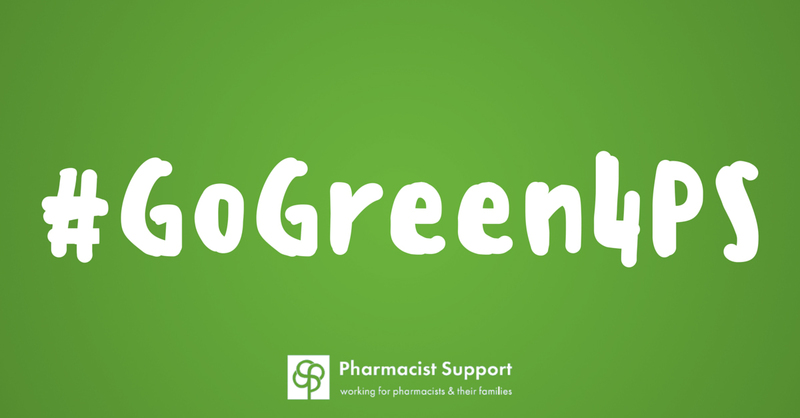 25th September is World Pharmacists Day and the start of The Pharmacy Show – the largest national conference and exhibition for community pharmacy professionals – where this year we will be launching our Go Green for Pharmacist Support activities! This is a week long event that everyone can get involved – a chance for colleagues, friends and employers to come together and bake, make, eat, travel, buy or wear something green to help raise vital funds for Pharmacist Support. Pharmacist Support touches the lives of hundreds of pharmacists and their families, former pharmacists, pre-registration trainees and pharmacy students across GB every year. Since relaunching as Pharmacist Support (previously The Benevolent Fund) back in 2008 the charity has provided over 10,000 acts of support to those in the profession facing difficult situations. Go Green is a great way to bring colleagues together, to inject a sense of fun into the workplace while at the same time raising money for charity. Whether you are a team of three or a company of thousands there is a Go Green activity for you! You could hold a bake sale or a dress down day, encourage staff to walk or bike to work, or hold a green themed quiz – as long as it’s green, anything goes! Put up posters on shelves, on doors and in lifts – anywhere that will catch people’s attention and tell them what you’re doing to Go Green! Ask everyone for a donation to wear something green – socks, a wig or head-to-toe. What about charging people a forfeit fee if they come in without something green? Ask your employer about matched funding – that way you can double the money you raise. Also, if you’re attending the Pharmacy Show, pop along to our stand (PG31) and join in with our celebrations. Not yet registered? Book your FREE place here! £3000 – provides an Mpharm student who has overcome some form of adversity with a bursary to help them excel in their studies. We look forward to hearing about all of your green ideas and remember to share them with us on our Facebook and Twitter pages using the hashtag #gogreen4PS and @pharmasupport.